In case you somehow happened to miss yesterday's "Hadoop World Conference" in San Jose, we bring you the following video of GFEED's own Sol Hsiang -- who despite looking very sharp in his suit + earpiece/headset thingy, conspicuously fails to use the word "hadoop", and conspicuously fails to get introduced by Obama, as the speaker before him did. Since Sol no longer posts, hopefully this video will at least partially sate loyal GFEED readers' desire for Hsiang-related blog activity. Have a good weekend! Lately I’ve been thinking about siestas. And not just because of the extremely warm summer – I mean February – we are having in California. Taking an afternoon break is probably one of the oldest and most widespread adaptations humans have in the face of hot weather. Better to work hard in the morning and late afternoon when the heat is not too bad, and take a break when you would otherwise be unproductive. For example, I was never so willing to wake up at 4am as when I was doing field work in Sonora, Mexico in July – it meant I could get most of the day’s work done by lunch and not face the afternoon sun and heat. I can only guess that a similar strategy explains Max’s daily naps in his office, though Berkeley isn’t typically all that hot. Although humans have widely adopted this practice, we don’t typically think of it as a strategy for how we grow crops. But various studies seem to suggest that the best way to adapt to extreme heat may be to have crops take a break. This can be done on two different time scales. In a day, we can select for crops that slow down growth during hours that are the hottest, and have the highest vapor pressure deficits. This avoids using water at the times when the efficiency of using water would be lowest. A nice recent review by Vincent Vadez and colleagues discusses some of the ways crop scientists are selecting for this trait. As I’ve mentioned in past posts, it’s a strategy we are trying to evaluate as a possible adaptation to climate change. It probably helps a little, but it’s not clear how much. At longer time scales, it’s possible to just scrap the idea of growing a crop during the peak of the summer, and instead try to fit in two crops that straddle this period. This is the idea behind a recent paper we have led by my student, Chris Seifert, on double cropping trends and potentials in the US. Part of the challenge of double cropping is that it pushes the late summer crop (typically soybean) into greater risks of frost damage at the end of the season. But with warming temperatures, crops develop more quickly and the frost dates recede. This idea has been around for a while, but the idea of the paper was to simulate how much more viable the practice is actually becoming and will continue to become. The basic approach was to develop a realistic model of phenology for a wheat-soy double crop, and see how often the two crops can be squeezed in between the last frost of spring and the first frost of fall. Below is a summary of the projected suitability (% years of survival) for current and future conditions under two emission scenarios (top is low emissions, RCP4.5, and bottom is high emission, RCP8.5). The current simulated limits match pretty well where existence of double cropping extends in reality (roughly to the south of Illinois). But by mid-century the area suitable has shifted at least a full state northward, and by 2100 is roughly double or triple the current suitable area depending on emission. It’s also slightly interesting that really warm scenarios actually make this particular system less suitable in the South, because wheat can’t vernalize properly. The other thing the paper looks at is whether warming has already encouraged a spread of double cropping. 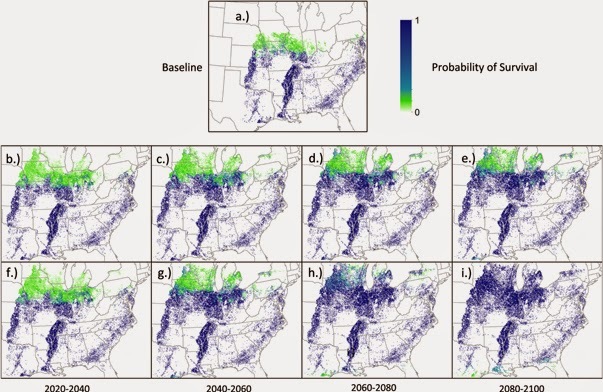 The data to look at double-cropping are pretty coarse in spatial resolution and short in time, but the trends do seem consistent with the simulated increase in suitability. 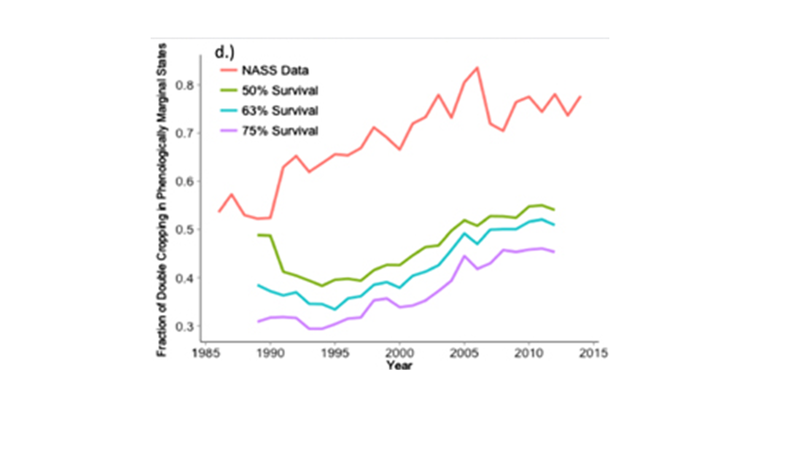 For example, the figure below shows the fraction of reported double-cropping (red line) in states that historically have had frost limitations vs. the simulated suitability in those states for three different thresholds of survival (survival = soy maturing before first frost). Just to be clear, this isn’t a definite gain relative to sticking with a single summer crop of corn or soybean. That would depend on prices and yields, both of which will also depend on what climate is doing. And even if it’s a gain, it could well still be worse than what could be achieved in the current climate with a single crop (for reasons we get into in the paper). Just like taking a siesta may make you more productive than if you didn’t, but not more productive than you’d be without the hot weather. But if nothing else it is an intriguing option that could make sense in a lot more places than it used to. And for many places it falls in the category of things that wouldn’t make much sense without climate change, because of the frost constraint, which I think is a key criterion for a truly effective adaptation. Overall, maybe the lesson here is the corollary of what Marshall blogged about a few months ago. If we are learning that people’s response to heat is empirically not that different from crops, maybe it follows that strategies people have adopted to deal with heat can give us an idea of what might work well with crops. And maybe with all the heat lately – at least in the Western U.S. – people should start taking more siestas too. Max must just be testing out his adaptation strategy. One morning last August a number of economists, engineers, Silicon Valley players, donors, and policymakers met on the UC-Berkeley campus to discuss frontier topics in measuring development outcomes. The idea behind the event was not that economists could ask experts to create measurement tools they need, but instead that measurement scientists could tell economists about what was going on at the frontier of measuring development-related outcomes. One topic that generated a lot of excitement -- likely due to David Lobell's charm at the podium -- was the potential for a new crop of satellites to remote-sense (i.e. measure) important development outcomes. The vision of this “remote-sensing” based approach to research is clearly intoxicating, and is being bolstered by the vast amount of high-resolution satellite imagery that is now being acquired and made available. The recent rise of “nano-“ or “micro”-satellite technology – basically, fleets of cheap, small satellites that image the earth in high temporal and spatial resolution, such as those being deployed by our partner Skybox – could hold particular promise for measuring the types of outcomes that development folks often care about. This is perhaps most obviously true in agriculture, where unlike in the manufacturing sector, most production takes place outside. For most agricultural crops – particularly the staple crops grown by African smallholders, such as maize – pretty much anyone can look at a field and see the basic difference between a healthy highly productive crop and low-yielding crop that is nutrient or moisture stressed. One main clue is color: healthy vegetation reflects and absorbs different wavelengths of light than less-healthy vegetation, which is why leaves on healthy maize plants look deep green and leaves on stressed or dead plants look brown. Sensors on satellites can also discern these differences in the visual wavelengths, but they also measure differences at other wavelengths, and this turns out to be particularly useful for agriculture. Healthy vegetation, in turns out, absorbs light in the visible spectrum and reflects strongly in the near infrared (which the human eye can’t see), and simple ratios of reflectance at these two wavelengths form the basis of most satellite-based measures of vegetative vigor – e.g. the familiar Normalized Difference Vegetation Index, or NDVI. High ratios basically tell you that you’re looking at plants with a lot of big, healthy leaves. The trick is then to be able to map these satellite-derived vegetation indices into measures of crop yields. There are two basic approaches (see David's nice review article for more detail). The first combines satellite vegetation indicies with on-farm yield observations as collected from the typical household or agricultural surveys. 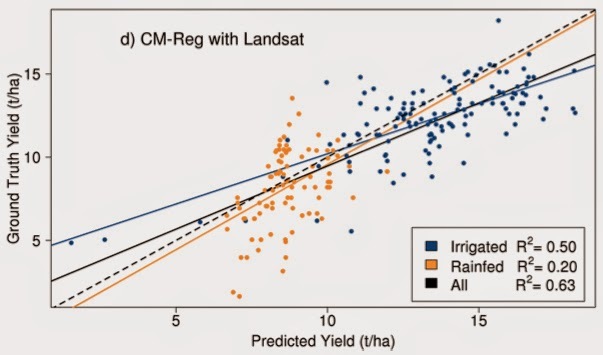 By regressing the “true” survey-based yield measure on the satellite-based vegetation index, you get an estimated relationship between the two that can then be applied to other agricultural plots that you observe in the satellite data but did not survey on the ground. The second approach combines the satellite data with pre-existing estimates of the relationship between final yield and vegetative vigor under various growing conditions (often as derived from a crop simulation model, which you can think of as an agronomist’s version of a structural model). 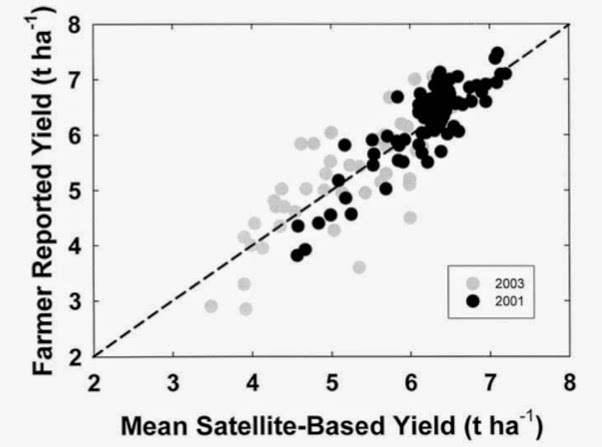 Applying satellite reflectance measures to these relationships can then be used to estimate yield on a given plot. A nice feature of this second approach is that it is often straightforward to account for the role of other time-varying factors (e.g. weather) that also affect the relationship between vegetation and final yield. These approaches have mainly been applied to larger farm plots in the developed and developing world, at least in part because until very recently the available satellite imagery was generally too coarse to resolve the very small plot sizes (e.g. less than half an acre) common in much of Africa. For instance, the resolution of the MODIS sensor is 250m x 250m, meaning one pixel would cover more than 15 one-acre plots. Nevertheless, these approaches have been shown to work surprisingly well on these larger fields. Below are two plots, both again from David and co-author's work, showing the relationship between predicted and observed yields for wheat in Northern Mexico, and maize (aka “corn”, for Americans) in the US Great Plains. 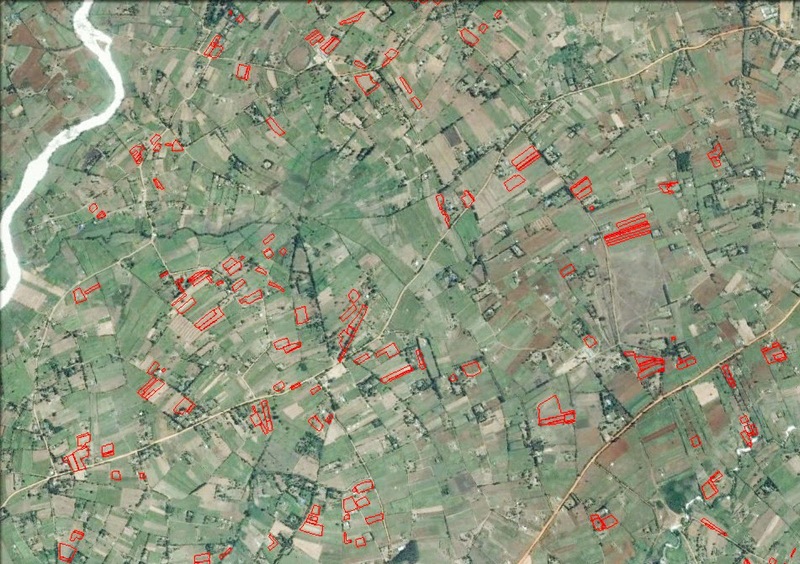 Average plot sizes in both cases are > 20 hectares, equivalent to at least 50 one-acre plots. Top plot: wheat yields in northern Mexico, from Lobell et al 2005. Bottom plot: corn yields in the US Great Plains, from Sibley et al 2014. Applying these approaches much of the developing world (e.g. smallholder plots in Africa) has been harder. This is not only because of the much smaller plot sizes, and thus the difficulty (impossibility, often) of resolving them in existing satellite imagery, but also because of a lack of either (i) ground truth data to develop the satellite-based predictions, and/or (ii) a satisfactory mechanistic understanding in these environments of how to map yields to reflectance measures. Working with David and some collaborators in Kenya, Uganda, and Rwanda, we are linking this new imagery with ground-based yield data we are collecting to understand whether the satellite data can capably predict yields on heterogeneous smallholder plots. Below is a map of some of the smallholder maize fields we have mapped and are tracking in Western Kenya, as part of an ongoing experiment with smallholder farmers in the region. Second, we still have a surprisingly poor understanding of why some farms, and some farmers, appear to be so much more productive than others. Is it the case that relatively time-invariant factors like soil type and farmer ability explain most of the observed variation, or are time-varying factors like weather more important? Satellite data might be particularly useful for this question (David's review paper, and his earlier G-FEED post, gives some really nice examples), because you can assemble huge samples of farm plots that can then be easily followed over time. Satellite data in this setting therefore might afford more power, and you can do it all in your pajamas. Francis Annan and I have a new paper that looks at US crop insurance and whether it gives farmers a disincentive to adapt to extreme heat. The increased frequency of extreme heat under climate change is predicted to lower corn and soybean yields going forward. Reducing the sensitivity to extreme heat would go a long way in avoiding some of the predicted damages, but there has been no observable progress in relative heat sensitivity over the last six decades. One possible explanation is that government policies bail out farmers and give them a disincentive to adapt. The United States Federal Crop Insurance Program (FCIP) has gained tremendous momentum in recent decades and has become one of the major agricultural support program in the United States. Created in the 1930s, the crop insurance programs have undergone many developments through the revisions in various federal farm bills, acts, and assistance programs. The 1994 "Crop Insurance Reform Act" had the goal to eliminate annual disaster programs. It made participation in the insurance program mandatory to be eligible for disaster payments. This act implemented catastrophic (CAT) coverage to protect producers against major losses at no cost to producers. In recent years, legislative mandates have further increased the premium subsidy, in addition to the introduction of new insurance products. As a result the program has experienced tremendous growth in participation, especially following the 1994 act (Annan, Tack, Harri and Coble). The fraction of total crop insurance premiums that is subsidized by the government greatly increased between 1981-2013, especially following the 1994 Crop Insurance Reform Act as shown in the following graph. 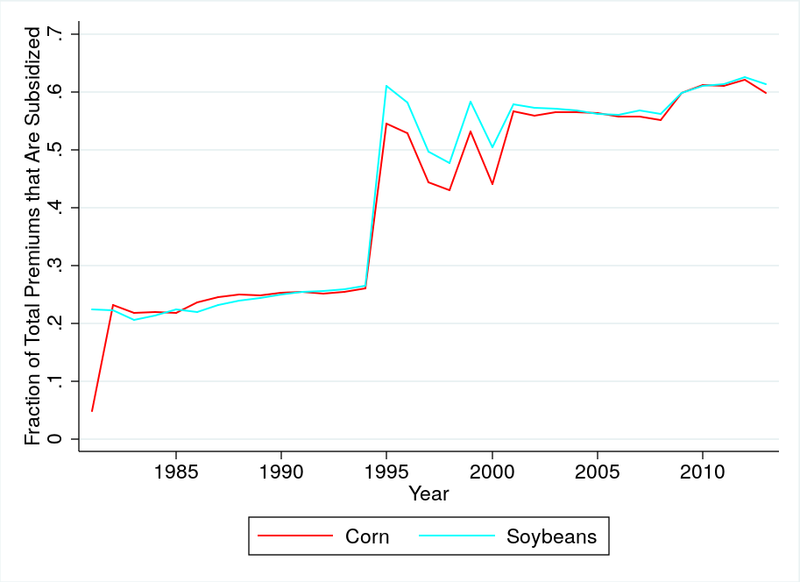 Subsidy ratios increased from 20% in the early 1980s to 60% in recent years for both corn and soybeans. The following figures show total planted area for corn and soybeans as solid lines, which has remained rather constant between 1981-2013. The dashed line shows the planted area that is insured under the federal crop insurance program. There is a large increase over time and by now almost all planted area is insured. Did the increase in insured area increase the sensitivity to extreme heat? We run a regression where we link log yields in a county on four weather variables: moderate heat, extreme heat and a quadratic in season-total precipitation (April-September). We also include county fixed effect, year fixed effects to pick up shifts in overall price levels or regulatory changes and county-specific quadratic time trends as there have been different warming trends across the US (Burke and Emerick). Finally, we interact the weather measures with the fraction of the area that is insured. The results are given in the following table. Columns (a) replicate the standard weather-yield relationship. We find that extreme heat has a harmful effect that is an order of magnitude larger than the beneficial effect of moderate heat. The results also indicate am inverted-U-shape for precipitation that is comparable to previous results and implies an optimal amount for precipitation that is comparable to agronomic estimates. Columns (1b) and (2b) interact the weather-sensitivity of yields with the fraction of the area planted that is insured. The weather-sensitivity of an uninsured field is the coefficients on the weather variable, while the sensitivity of an insured field is the sum of the coefficient on the weather variable and the interaction term. We find that for both corn and soybeans, insured areas exhibit the same sensitivity to beneficial moderate heat, but are more sensitive to fluctuations in extreme heat. 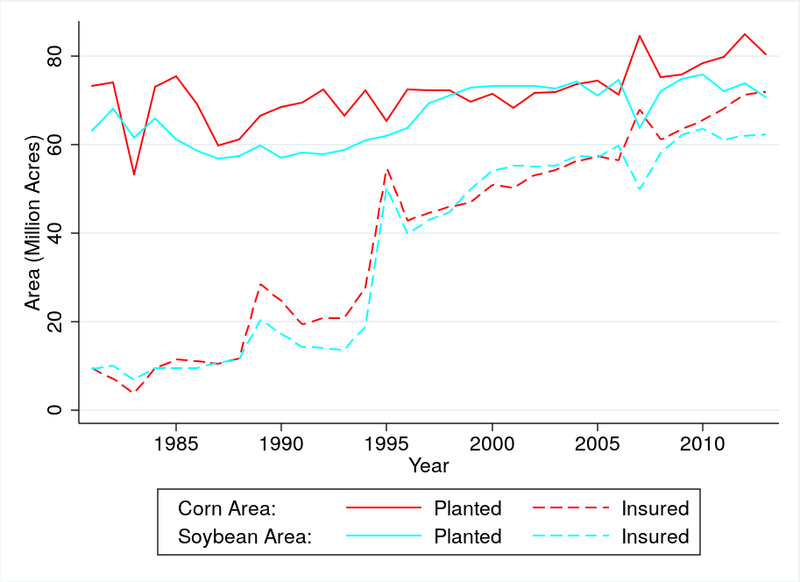 The sensitivity to extreme heat is 67% larger for insured corn than for uninsured corn and 43% larger for insured soybeans than uninsured soybeans. 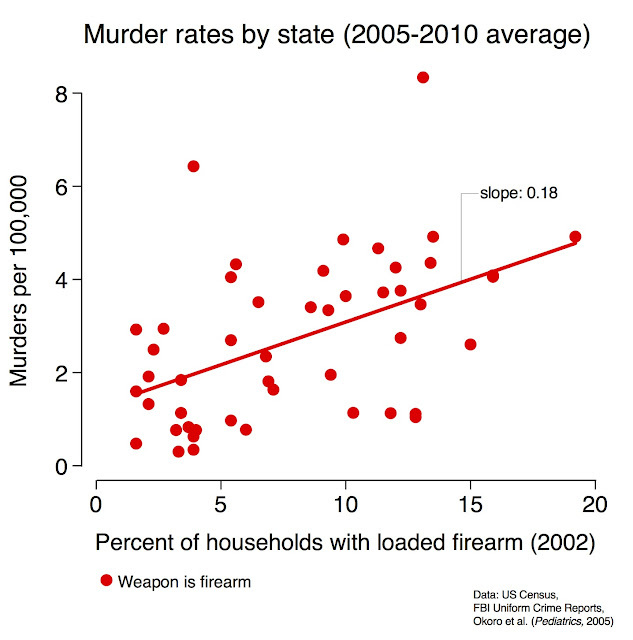 We conduct various sensitivity checks: The results are comparable whether we use a common quadratic time trend for all counties, a state-specific quadratic time trend, or the county-specific quadratic time trends. Most importantly, the results are consistent whether we estimate them for the years 1981-2013, 1981-1996, or 1997-2013. Average subsidy rates in the first half are 27% but increase to 55% in the second half as the insured planted area increase from roughly one-fourth to three-fourth while the total planted area remains constant. While insurance coverage is endogenous, our coefficients of interest interact it with exogenous weather variation. The interacted coefficients correctly identify the sensitivity of the insured field, however, it could be because insured fields are different (e.g., marginal land that is ensured has higher sensitivities), or because crop insurance gives a disincentive to reduce the damaging effects. We believe it is the latter: the heterogeneity story seems unlikely given that we account for county fixed effects, year fixed effects as well as county-specific time trends during a time period when insurance coverage greatly increases. The marginal decision on which areas to insure hence greatly changes over our study period.